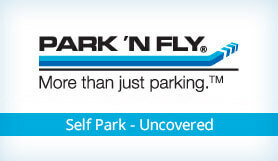 Park 'N Fly are one of America's most popular parking brands. There are several off-site airport parking options available around DFW airport, but there's only one Park 'N Fly. With their close proximity to the airport and high levels of customer services, you can only succeed by choosing to park here. One stay with Park 'N Fly and you'll know they are more than just a car park, and they'll strive to make your travel experience as easy as possible. Please note, you'll receive a reservation email from both Looking4, and the parking lot. Complimentary, Continuous Shuttle Service: Whether it's at your car or the airport, Park 'N Fly shuttle will pick you up in 5 minutes or less, seven days a week. Luggage Assistance: Park 'N Fly drivers are available to help you lift and carry your luggage on and off the shuttles. 24-hour Security: The Dallas / For Worth Airport Parking lot is gated and well lit, so you can leave knowing your vehicle is safe and secure. You will pull a ticket from the entry column when you enter.